Average mortgage rates today, except for some government-backed programs, did not change. And even the FHA and VA programs didn’t move much. Because most of the important economic reports have been held back by the government shutdown, interest rates are largely in limbo. Traders and lenders have little information on which to base their decisions. December’s Existing home sales report, which comes from the National Association of Realtors and is unaffected by the shutdown, showed that home sales plunged from last month’s annualized 5.32 million to 4.99 million, Analysts had predicted 5.1 million. This indicates economic slowing and also lower demand for mortgages. That’s good for borrowers and mortgage rates. Most of today’s financial data signal lower mortgage rates. CNNMoney’s Fear & Greed Index moved up 1 point to a neutral 52 (out of a possible 100). The upward direction of movement is bad for rates. “Greedy” investors push bond prices down (and interest rates up) as they leave the bond market and move into stocks, while “fearful” investors do the opposite. Rates appear to be static, and with the government shutdown, investors are wary. 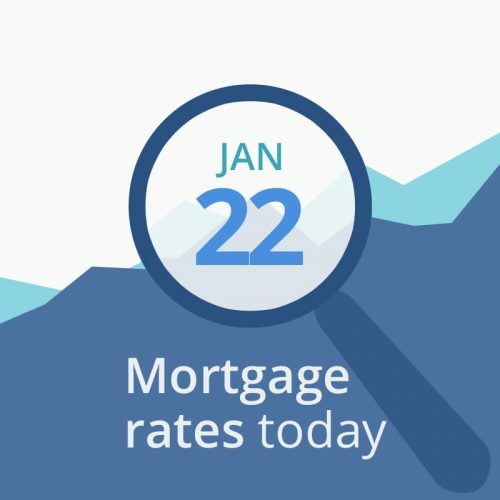 Today’s information (such as it is) does show that borrowers probably don’t need to worry about rate increases, and may see reductions later today and tomorrow. I am taking a less-conservative stance today, but if you’re risk-averse and today’s rates are acceptable to you, you might want to lock.